The thermal mechanical problems can be treated with the help of Ansys or Catia. 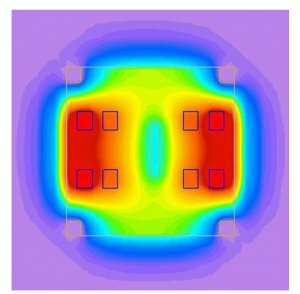 The coupling is possible between a map of temperature and a mechanical structure to study the constraints and the dilations. 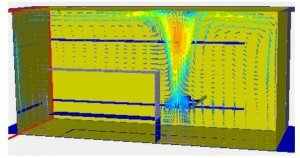 The pure thermal problems (conduction, convection and radiation) can be treated Ansys. The problems thermal fluid or purely fluid ( CFD) is treated by means of Ansys. The designer chooses the appropriate tool and defines in the best way his finity model element / volume depending on his study case. In the case of the project of calorimeter of the project PANDA, crystals of PbWO4 associated to APD (Avalanche Photo Diodes) are used for the reading of the answer in light, what requires to stabilize the temperature in-25°C in + /-0,1°C. During the design of the first prototype, simulations of thermal and fluid type using the Flotherm software, coupled with experimental measures, allowed to determine the best possible assembly of electronic components and cables to choose heat shields of low thickness, to reach the stability in required temperature. The construction of detectors needs, more and more, to take into account the thermal constraints introduced by the power dissipation of electronic components. But it can be necessary to put on the detector in a given temperature and in a stability to insure the good quality of the measure. In the project ALICE, the heat power dissipation due to the electronics could alter the running of detectors (maxi temperature 40°C for the electronics). For the PANDA project, the functioning temperature of the detector is at -25°C with a precision of + /-0,1°C. In both cases, the link with the mechanical design is essential to limit the thermal bridges and integrate as soon as possible the cooling system into the design of the detector. We use systems by air or water and do for it various analyses : Aeraulics, calculation of the losses of loads for the sizing of the power plants of cooling, calculation of the thermal transfers, R&D on the thermal screens and the insulating panels. Every concept can is defined or optimized by various tools of calculation : analytics (thermal reference), simulations by finished elements / volumes (Ansys). The department is equipped with a bench of measure of temperature and with flow to validate the studies by one or several prototypes.